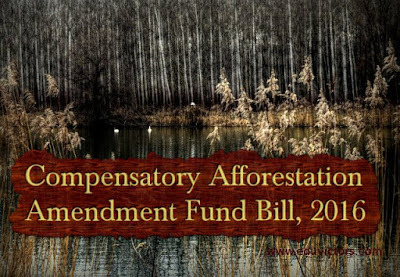 ① The compensatory Afforestation Fund Bill, 2016 was passed on Ju1y 29, 2016 by the Parliament. 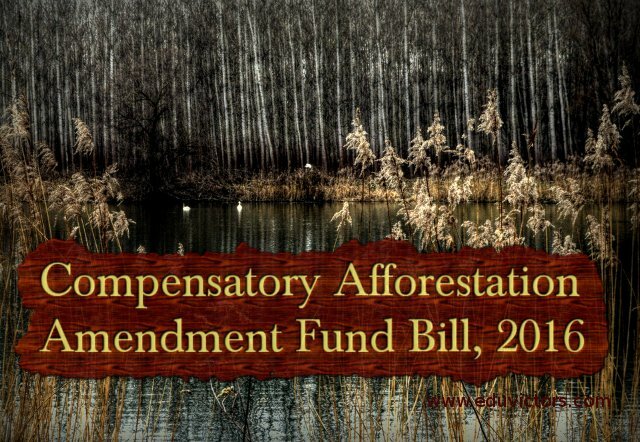 ② The bill provides establishment of funds under the public accounts of the centre and state levels for compensatory afforestation. ③ The Bill has ended the long era of ad-hocism and will help the Centre and State Governments to utilise these amounts in a planned manner. It will facilitate make available more than Rs. 6,000 crores per annum to the States/UTs for conservation, protection, improvement and expansion of forest and wildlife resources of the country. ④ It establishes National Compensatory Afforestation Fund (NCAF) under the Public Account of India, and a state compensatory Afforestation Fund (SCAF) under the Public Account of each state. ⑤ The payments into the funds include compensatory afforestation, net present value of forest (NPV), and any project speciﬁc payments. ⑥ The NCAF will get 10% of funds collected and the remaining 90% will go to respective state Fund. ⑦ It establishes National and state Compensatory Afforestation Fund Management and Planning Authorities (CAMPA) to manage the funds. ⑨ The determination of NPV will be delegated to an expert committee constituted by the central government.